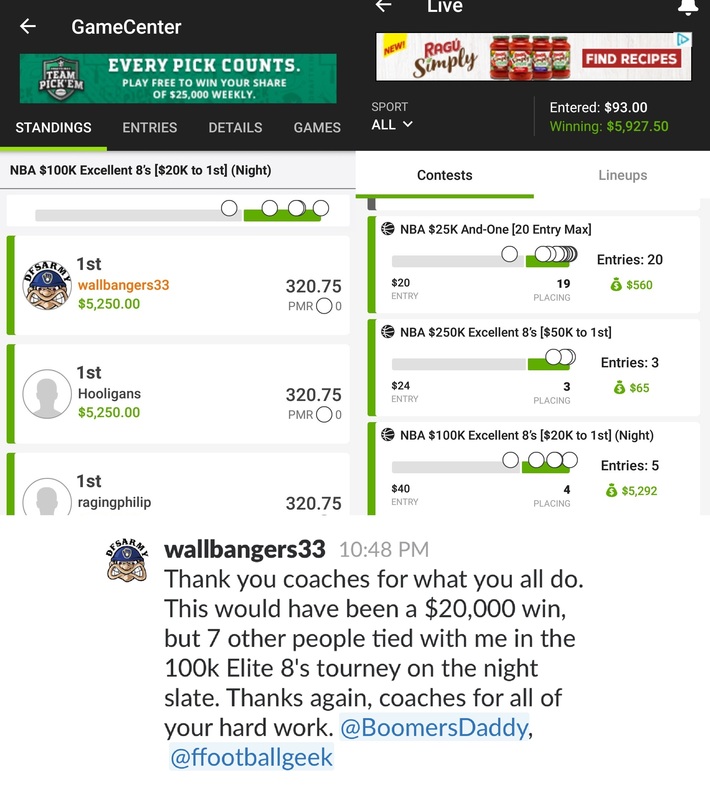 10/21/18: Congratulations to DFS Army Member Wallbangers33 on taking down 1st place last night on DraftKings in the NBA $100k Excellent 8’s winning $5,250! 9/24/18: Congratulations to DFS Army VIP Member Berubster on this $50,000 1st place finish in the MLB $150k Extra Inning on DraftKings tonight! 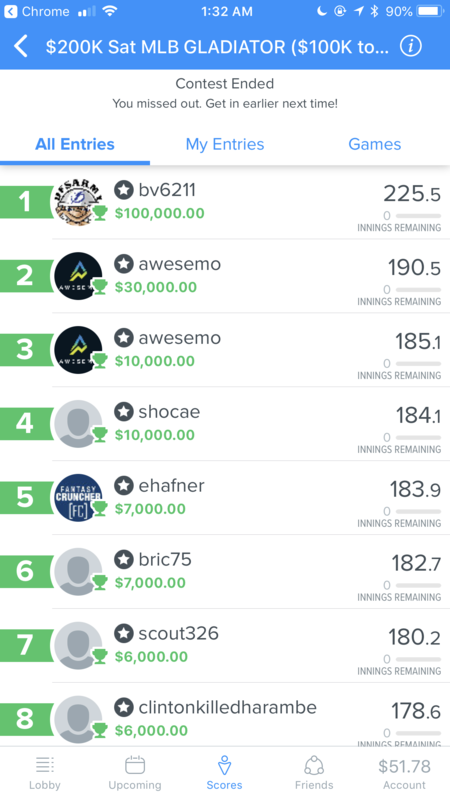 9/23/18: Congrats to DFS Army Member themacwins on this $25,000 1st place finish in the NFL $150k Spy Single Entry Contest on Draftkings this week! 9/16/18: Congratulations to DFS Army VIP Member kbiggz on this 2nd place finish in the $3.5M NFL Sunday Million on Fanduel winning $200,000! 9/10/18: Congratulations to DFS Army VIP Member sunevborn on this huge $30,000 win in the $1M Monday Night Million on Fanduel! 9/9/18: Congratulations to DFS Army VIP Member kngof9ex and DFS Army Staff Member CactusJack2 (aka TheDFSniper) on taking 1st place in the $250k Fantasy Racing World Championship Round 1! They will be representing the DFS Army at the live final in Charlotte!! 9/9/18: Congratulations to DFS Army VIP Member Taylor47 on this huge $30,000 cash placing 4th place on DraftKings during NFL Week 1! 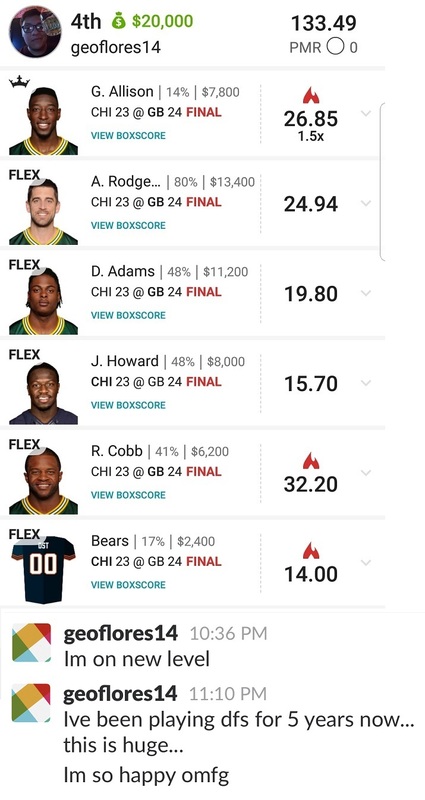 9/9/18: Congratulations to DFS Army VIP Member geoflores14 on this $20,000 4th place finish in the Sunday Night Primetime Showdown on Draftkings during NFL Week 1! 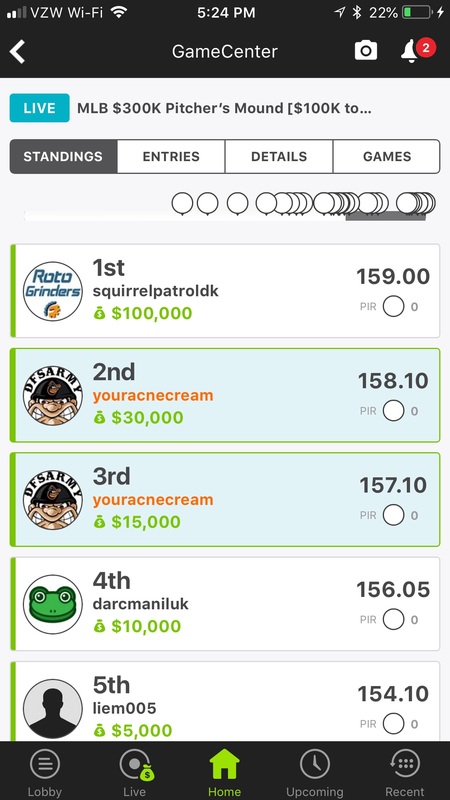 9/3/18: Congratulations to DFS Army VIP Member youracnecream (joshtherealtor in slack chat) on taking down 2nd and 3rd place in the MLB $300k Pitchers Mount on DraftKings Early Slate today winning $45,000! 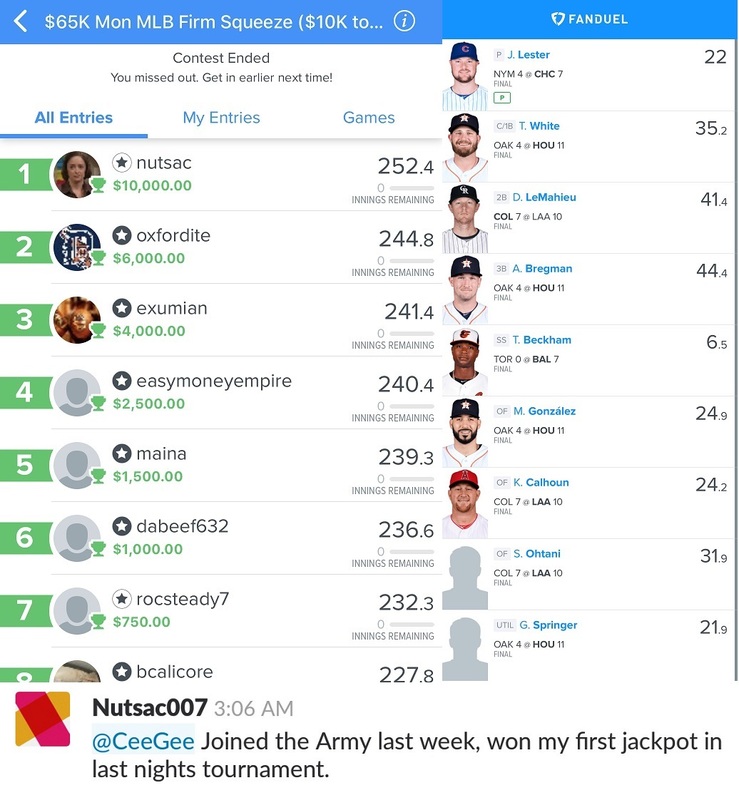 8/27/18: Congratulations to new DFS Army Member nutsac on this $10,000 first place finish in the $65k MLB Mon Firm Squeeze on FanDuel! 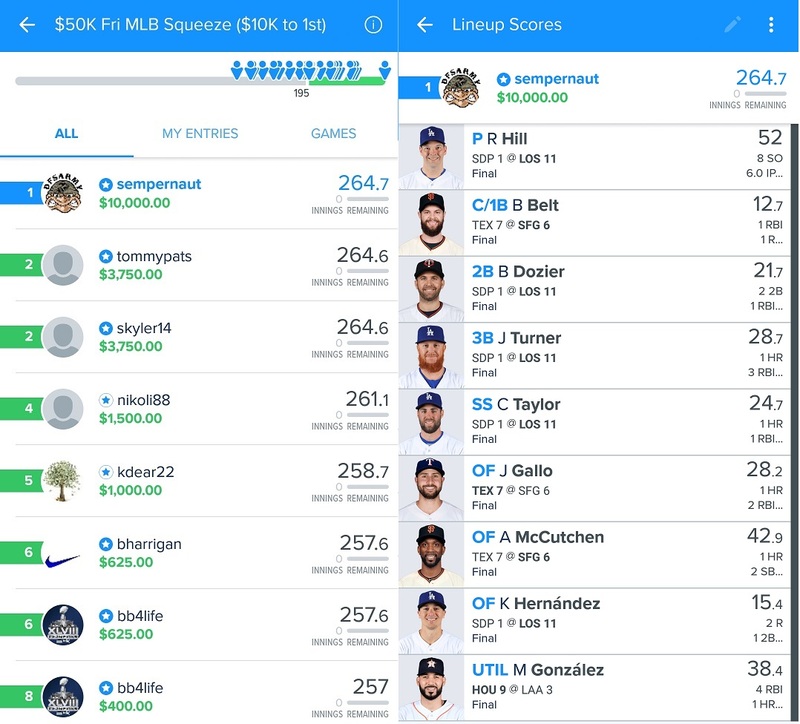 8/24/18: Congratulations to DFS Army VIP Member Sempernaut on this 1st place finish in the $50k Fri MLB Squeeze on FanDuel last night winning $10,000! 8/6/18: Congratulations once again to DFS Army VIP Member bv6211 (dradt8386 in chat) on yet another huge win. 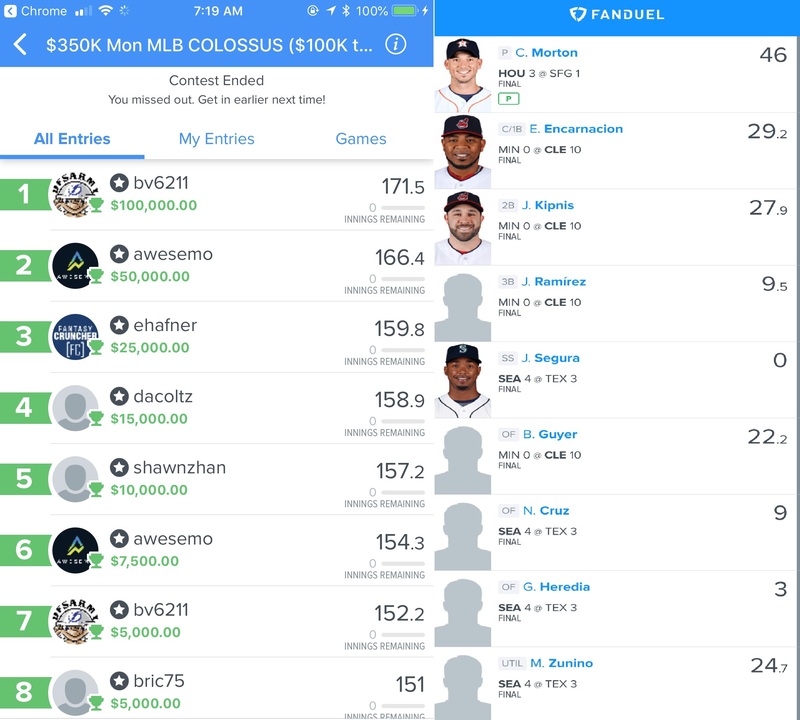 Today he took down 1st place for $100,000 in the $350k Mon MLB Colossus on FanDuel. That’s $200,000 won by him in 2 days and $300,000 in the last 3 months. 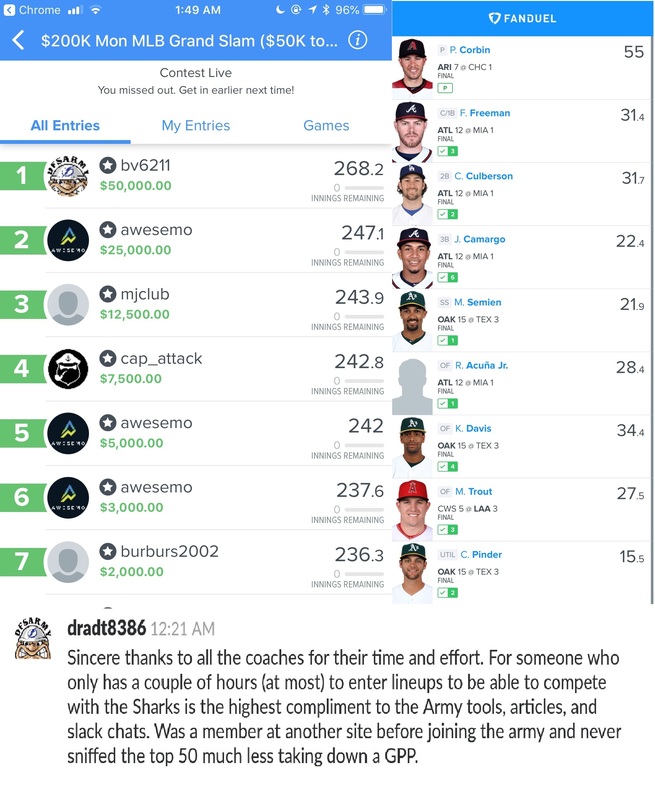 8/4/18: Congratulations to DFS Army VIP member bv6211 (dradt8386 in chat) on taking down 1st place for $100,000 in the $200k Sat MLB Gladiator on FanDuel. 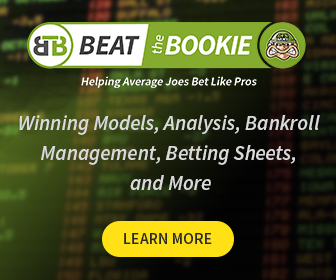 He has won about $200,000 in the last 3 months! 8/2/18: Congratulations to DFS Army VIP member bv6211 on another big win. Today h-e took down $10,000 and 1st place in the $20k MLB Monster on DraftKings. This is his 4th huge win in about 3 months time totaling over $90,000! 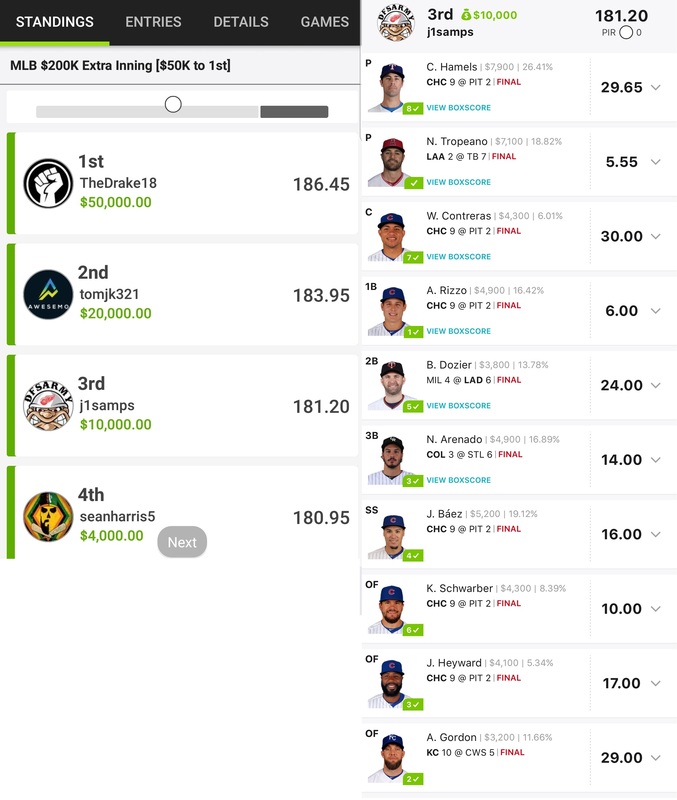 8/1/18: Congratulations to DFS Army Member j1samps on this 3rd place finish in the MLB $200k Extra Inning on DraftKings! He won $10,000 with this big finish! 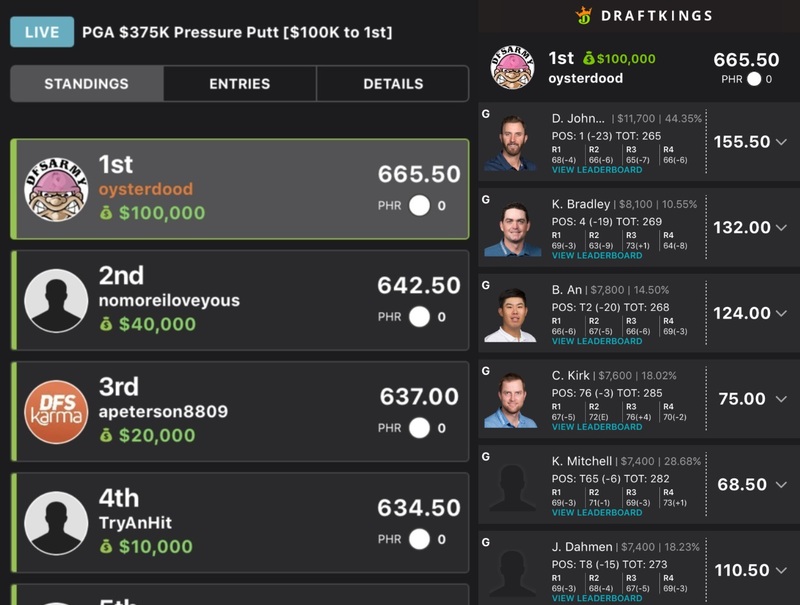 7/29/18: Congratulations to DFS Army Member oysterdood on taking down 1st place in the PGA $375k Pressure Putt on DraftKings winning $100,000! 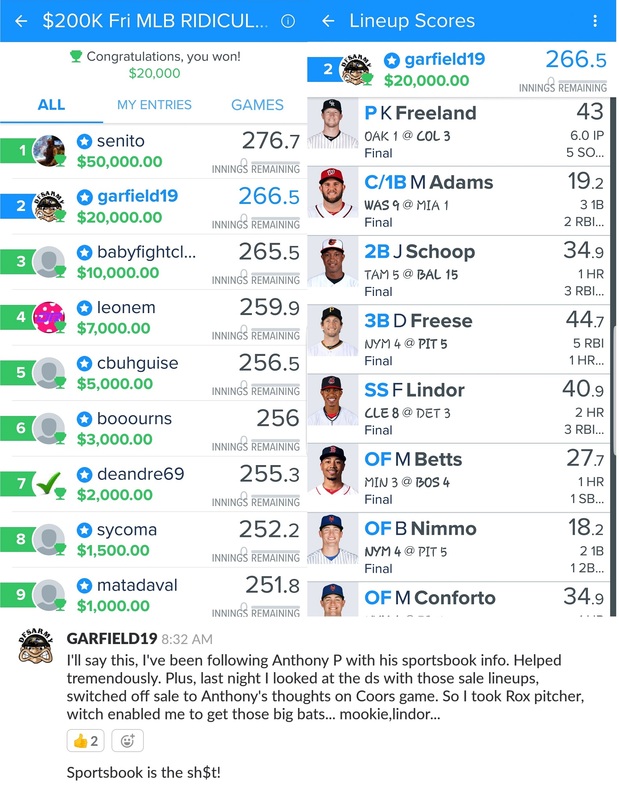 7/27/18: Congratulations to DFS Army Member bigpapi99 (easyrawlins in Slack Chat) on taking down 2nd place for $10,000 in the $80k Fri MLB Grand Slam on FanDuel! 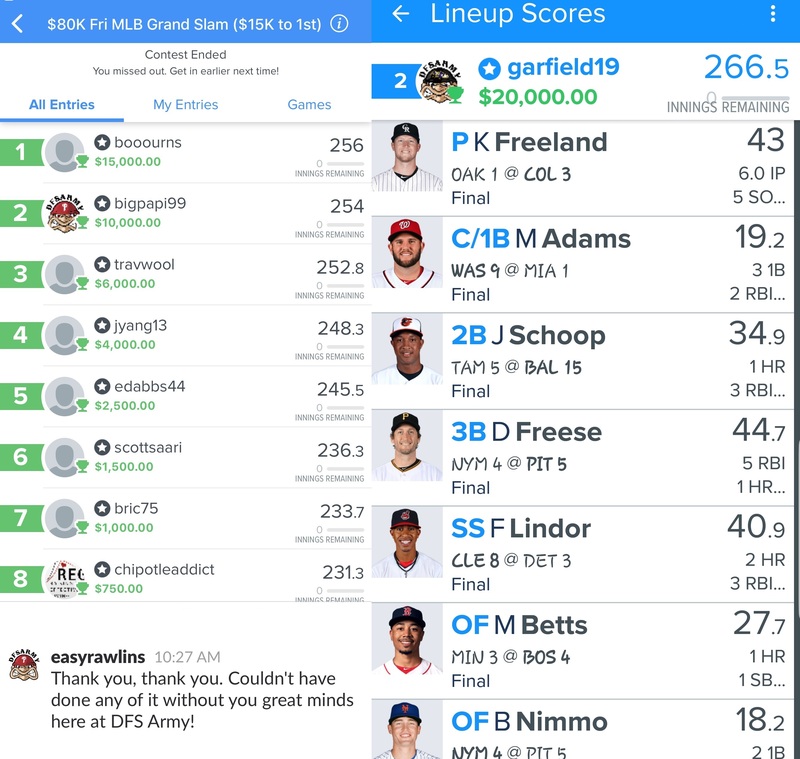 7/27/18: Congratulations to DFS Army VIP Member Garfield19 on this huge 2nd place finish for $20,000 in the $200K Fri MLB RIDICULOUS Rally on FanDuel tonight! 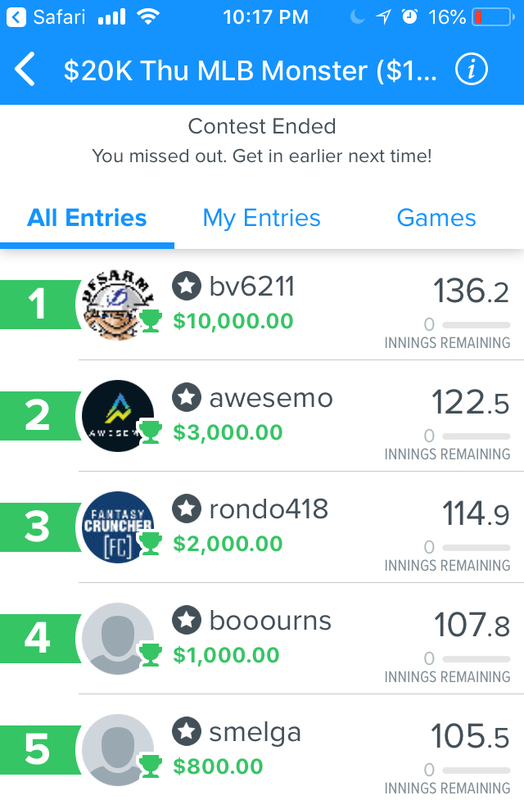 7/23/18: Congratulations to DFS Army Member bv6211 (Dradt8386 in Slack Chat) on taking down 1st place for $50,000 in the $200k Mon MLB Grand Slam on FanDuel tonight! This is his second big win in a month (check out his $20,000 win on 6/6/18 below). 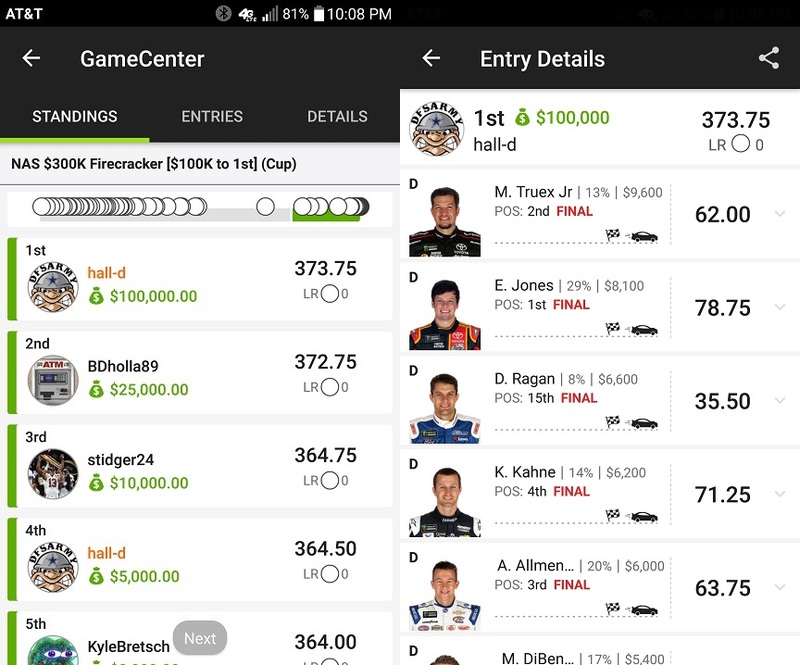 7/7/18: Congratulations to DFS Army VIP Member Hall-D (DuhRambler in Slack Chat) on taking down 1st Place for $100,000 in the NAS $300k Firecracker in Nascar on DraftKings! He took down this very same contest last year winning $50,000!